I’ve said before that I have a great respect for the writings of Marilynne Robinson. 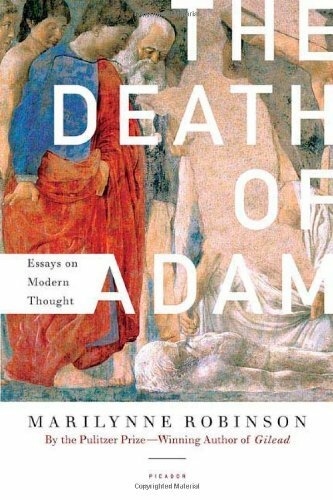 I haven’t read as much of her writings as I’d like, and so on a recent vacation I decided to pick up her collection of essays, The Death of Adam: Essays in Modern Thought, which was published in 1998. One common way of thinking about the Christian God is as the Divine Watchmaker, which I believe comes from William Paley’s description of the teleological argument in Natural Theology. (The teleological argument is, roughly, the argument from the evidence of the universe being designed to the existence of a Designer.) What does it mean to think of God as the Divine Watchmaker? Basically, that God is to the world what a watchmaker is to a watch. But is the Christian God best thought of as a Divine Watchmaker? The God of Abraham, Isaac, and Jacob, or of Luther, Calvin, and Ignatius of Loyola, or of Dietrich Bonhoeffer, Simone Weil, and Martin Luther King, is no Watchmaker. To find him at the end of even the longest chain of being or causality would be to discover that he was a thing (however majestic) among things…. If one looks at the creation narrative in Genesis one finds no Watchmaker, as the Darwinists would have us believe, but a God who stands outside his creation, and calls it into being by, in effect, willing its existence. This terse account does as little to invoke the model of a human artisan as it could do. The creation and blessing of everything, from light to the great sea creatures to whatever creeps on the part, is done in the same formulaic terms. It all has the same origin, and it is all good…. The narrative stabilizes essential theological assertions, first of all, that God is not embodied in any part of creation. He is not light, nor is he the sun, as the gods of other ancient people were thought to be. He is in no sense limited or local. He is not the force of good or order struggling against forces of evil or chaos, but the sole creator of a creation that is in whole and in part ‘very good.’ There are no loci of special holiness, humanity aside, and nothing evil or alarming or unclean. The sun and moon are simply ‘lights’ and the markers of days and seasons. The alternation of day and night are not the endless recurrence of a terrifying primal struggle but the frame of a great order, identified by the repeated reference to evening and morning with the ordering of creation itself. All these things articulate a vision of being which is sharply distinct from those expressed in competing ancient cosmogonies. The narrative, with its refrain, tells off the days in a week, and culminates in the Sabbath, which is, therefore, as fundamental a reality as creation itself. It is as if God’s rest were the crown of his work. This is a very powerful statement of the value of the Sabbath, so essential to the life of the Jews, and it seems to me it probably accounts for the fact of the narrative’s describing creation as the business of a week. Certainly this cosmogony describes a natural order which is freestanding and complete, with rainfall and seasons established, as well as the fecundity of all living things…. I know this was a long quote; forgive me for including much that was only tangentially related to the question of whether the Christian God can be thought of as a Divine Watchmaker. But it is essential to her rejection of the Divine Watchmaker conception of God that you understand that the opening chapters of Genesis work hard to show that God is not just some other “thing among things,” as she puts it. A watchmaker is just a thing intelligent enough and powerful enough to create a watch. And, if God is the Divine Watchmaker, then He is just a thing supremely powerful and intelligent, intelligent and powerful enough to create the world. So, whether you accept or reject Robinson’s key point here, you at least have to admit that it isn’t obvious that Christians should easily accept the Divine Watchmaker view of God, a view prevalent in most of the writings in apologetics. Christian God is a Watchmaker And he is wholly different and outside of his creation. Several problems here. First, the Design argument is not meant to reveal How different God is from his creation. Secondly, even if psychologically speaking, the result is people misperceiving aspects of God’s nature then we should address those misperceptions. “To find him (God) at the end of even the longest chain of being or causality would be to discover that he was a thing (however majestic) among things,” seems strange formulation to help us understand that God is wholly different than people. While I’m sympathetic to getting reader’s attention and conveying that God is outside of creation and that He is an unembodied mind why conflate “efficient cause” which is the intent of both the Cosmological and teleological descriptions of God’s “work” with God’s “nature”? God is at the end of a causal chain and as such “Can’t” be a thing! This is Plato’s, Aristole’s, Augustine’s and Aquinas’ view. Who exactly thinks that a necessary, uncaused, self-existing, unembodied mind, that transcends space and time is a thing? That is the premise in her argument I find most dubious. While I have no doubt’s about Marilynn’s Robinson’s assertion that Christians may anthropomorphize God, why equivocate his work with his attributes. It seems, although it’s not clear from the quote, to poison the wells to discussing God’s designing work. So since the topic is how subjects (humans) understand objects (God), why not speak directly about say, “Common Misunderstandings of God’s Nature,” or “Common Conflation of God’s Work with God’s Nature?” This type of representation would allow Robinson to deal with misconceptions about God’s nature without the concomitant damage to people’s understanding of God’s work. Disclaimer: I have not read her paper (couldn’t find a copy) and she may deal with all of my objections above once I understand her whole thought and context of her statements.